BEST-VIP Chauffeured Worldwide of Orange County, California is adding two industry veterans to their growing Motorcoach and Group Destination Support Team! SANTA ANA, CA: Brian Webber is a native of Southern California with over 20 years’ experience in motorcoach transportation. For ten years, Brian led the Western Region sales development for Coach America, significantly diversifying the organization’s revenue streams. Over the last 6 years Brian was the “Director of Sales” for the largest motorcoach supplier in San Diego. Brian brings strong industry relationships and impeccable organizational skills to the growing BEST-VIP team as our new Director of Business Development. Brian is happily married to his best friend Gretchen, who also works in the hospitality industry. They share their beautiful, five-year-old daughter Amelia. While he enjoys working with the BEST, Brian is also an avid sports fan who greatly enjoys the outdoors, hiking and traveling with his family. Hakan is happily married to Sheila, a fashion designer, and they share their beautiful six-year-old daughter, Mila, who loves art. When away from the office, Hakan and his family enjoy bike riding along Venice Beach, exploring Santa Monica and enjoying all the sights and sounds of California. Robert Vaughan, Founder of BEST-VIP, stated “our coach business has been steadily growing since 2008 and with the integration and acquisition of our nearest competitor more than 3 years ago, we needed to add some depth to position ourselves for our next growth stage. Brian and Hakan each bring excellent experience and value to the BEST-VIP team. 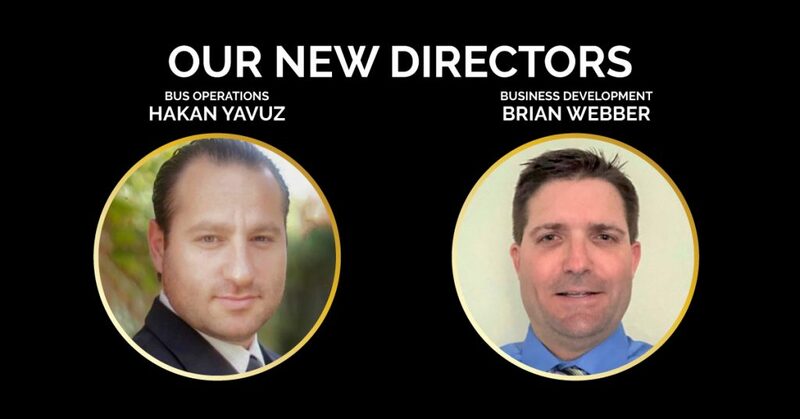 Brian is already helping us grow the sales side, while Hakan is bringing new safety, efficiency and regulatory experience. Brian and Hakan, combined with our seasoned team, will help us grow naturally and through acquisitions”. For more information on BEST-VIP Chauffeured Worldwide, visit www.bestvip.com or visit us on Facebook or Instagram. About BEST-VIP Chauffeured Worldwide: BEST-VIP Chauffeured Worldwide has been providing first class local, interstate and global transportation solutions since 1985. BEST-VIP maintains the largest fleet in Orange County serving corporations, celebrities, VIP’s, hotels, meeting planners, DMC’s, tour groups, schools, universities, sports teams, cruise ships and casinos as well as service in 500 cities and 50 countries—24 hours a day, 365 days a year.